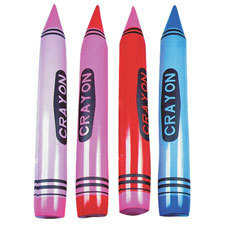 Inspire your budding artist with these giant Inflatable Toy Crayons! An inflatable classic: these blow up coloured pencils are perfect as a garden or pool toy. They come with a hoop to hang as a cool bedroom decoration and are also suitable as a stage prop for school or amateur dramatics. Easy to inflate; simply blow up the inflatable toy via the mouth piece and watch it take shape. Also a fantastic inflatable toy as a fancy dress accessory! This blow up toy measures 24 Inches long. Colour: choice of colours available: blue, red, brown, pink or purple - from the drop-down menu.